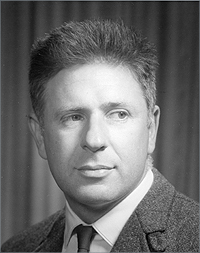 Marvin Goldberger was President of the California Institute of Technology (Caltech) and a friend of J. Robert Oppenheimer’s from his days at Princeton, after World War II. In this interview, he talks about his and his wife’s relationships with Robert and Kitty Oppenheimer. He also discusses Oppenheimer’s reputation as a physicist and personality, as well as how Oppenheimer fit into the social scene in post-war Princeton. Goldberger recounts how he first met Oppenheimer, and gives his impressions of other Manhattan Project figures including Robert Serber and Edward Teller. Martin Sherwin: President Goldberger, Marvin Goldberger of California Institute of Technology at Caltech in Pasadena, March 28, 1983. This is Martin Sherwin. This is something obviously I should have done three years ago back in Princeton when you had more time, etc. Marvin Goldberger: That’s all right. I have plenty of time. Sherwin: You first met [J. Robert] Oppenheimer after the war, right? Goldberger: Yes, that is right. I met him first in the summer of 1948. I was a post-doc at Berkeley. I was working at what is now called the Lawrence Berkeley Lab. It used to be called the Rad Lab, at that time. Sherwin: So he must have been there just coming back for a visit? Goldberger: Yeah, he was just passing through for a day. Sherwin: He had already been at the Institute [for Advanced Study]. Goldberger: That is right. He had been at the Institute already for about a year. I think he went in '47, is my recollection. Yeah. Sherwin: And how did you meet him, just at seminars? Goldberger: No, he came down to the Theoretical Physics Group where I was working, and we just sort of sat around, chatting about physics. Sherwin: Now, you did your work with [Edward] Teller in Chicago, right? Goldberger: I began my PhD under Teller, along with another physicist named Geoffrey Chew. And at a certain point, Teller said he was too involved in defense work, would we mind going to work for [Enrico] Fermi? Which was, you know, a terrible hardship [note: joking], and we somehow stood up under it. I actually got my degree with Fermi. Sherwin: I see. And what did you do your dissertation on? Goldberger: I worked on the interaction of high-energy neutrons with heavy nuclei. I did, I think, the very first application of the Monte Carlo technique to problems involving real nuclei. I literally followed the trajectory of 100 neutrons through a heavy nucleus and followed its course of evolution as it passed through. That subsequently has become a major industry, or for a period of time, it was a major industry. Of course, the technique is very widely used in experimental physics now. But it was sort of brand new. It was invented at Los Alamos during the war. Fermi said, “I would like to learn about the Monte Carlo method. Why don't you work on the following problem?” And so that is what I did. Goldberger: No. I finished that. I started working on problems of elementary particle physics that were related to experimental work that was going on at Berkeley at the time. Things like neutron bombardment of nuclei to produce deuterons and the theory of nucleon-nucleon scattering, which there were a lot of experiments going on there at Berkeley. Also, I got into the early days of the photo-production of mesons, because they had a synchrotron facility at Berkeley. And there was a very puzzling phenomenon which involved the ratio of the production of negative mesons as opposed to the production of positive mesons in these photon-induced reactions. Where originally, if I remember correctly, the ratio of negatives to positives turned out to be about seven or eight. And the theory setup should be about 1.4. It turned out that 1.4 was the right answer, and the other was experimental error. But I started working on quite different things. I abandoned that original project. Sherwin: You went to the Institute? Goldberger: No, I was never at the Institute as a fellow. Sherwin: I thought that because Oppenheimer wrote several very nice, I must say, recommendations for you to different things. Sherwin: Those are in the Library of Congress. Goldberger: No, I got to know him at conferences and things like that. I never had any close association with him. He was always a major figure at theoretical physics conferences. I really got to know him when we moved to Princeton in 1957. Sherwin: Well, why don't we then sort of dig in right there. Goldberger: All right. I discovered when we moved to Princeton—in fact, I had gone before I moved. I was trying to decide what I was going to do. I was in Chicago at the time. I had an offer from Berkeley and the hope of an offer from Princeton [University], although the then President of Princeton, Harold Dodd, refused to take any action on it, because I was apparently at least the first tenured professor in physics that they had ever contemplated bringing in from the outside. I have sometimes heard the story told, I was the first tenured appointment to come in from the outside. I cannot believe that that is true, but never mind. I had gone to talk with Oppenheimer and sort of questioned him about what he thought I ought to do. Ultimately it turned out I did get an offer from Princeton, as history has shown, and I went there. I discovered much to my surprise that in spite of having been there for ten years, the Oppenheimers had essentially no friends. And Oppenheimer did not have very close connections with the Princeton Physics Department. The issue of their friends, I think, was the result of two things. One is, the Institute occupied a social position in Princeton, which was markedly inferior to that of the University. It was regarded as a place where “those funny people who talked with funny accents” worked. The real power structure in Princeton centers around the university socially. The other thing is, Oppenheimer was an extraordinarily arrogant, difficult person to be with. He was very caustic. He was patronizing, and he was not a warm, easygoing guy. His wife [Kitty Oppenheimer] was even more difficult, having her own set of psychological and alcoholic problems that made it very difficult for her to fit into the framework of Princeton society, which tended to be really rather stiff. It became increasingly less so. When I first visited Princeton as a visiting professor in 1953, people were still leaving calling cards with corners turned down to tell you whether or not the husband had been there, and so forth. Sherwin: Would you explain that one to me? Goldberger: Well, there is a whole code of ethics with regard to paying a formal call. If there is no one there when the caller arrives, they may leave just the card of the wife. They may leave the card of both the husband and the wife. If one corner of a card is bent down, that means this is the second time that they have called. But there is a whole thing you would presumably find in ancient books of etiquette. Sherwin: When I was in the Navy, we all had these cards where, when you came to a new base or something and make a formal call on the captain of the base, you would leave your calling card at the door, and all that garbage. It was not taken very seriously by my generation. But they were still doing that? Professors had calling cards at Princeton? Goldberger: —and people in various parts of the social strata. Goldberger: Yeah. But professors, of course, did not have too much to do with that. I think it is probably clear—it certainly is true—that historically Princeton was relatively anti-Semitic, taken as a whole. Goldberger: That is certainly not a situation that exists at the present time, and it never really existed at the university. If you go back over the records and look at the number of Jews on the faculty, it is perfectly clear that that was not the way the university operated. But the town as a whole had that reputation. Whether it was well-deserved or not, I do not know. I never felt any anti-Semitism when I was there. When I found the sort of distance between Oppenheimer and the physics community, I tried to do something about it—the university physics community—I tried to do something about it. I have always felt a little funny in talking about this, because it sounds patronizing on my part. A number of things had happened to Oppenheimer. He really stopped doing physics in any serious way in about 1942. He never started up again. So in spite of the fact that he was incredibly quick and understood things with alarming speed, his depth of understanding was always very shallow because he never put pencil to paper. The second thing that happened to him, of course, was the trauma of the hearings, which had an unbelievably dramatic effect on him. Having been stripped of his advisory role and all of the trappings that went with that, not having a profession anymore, he did not really have anything to do. I arranged that once a week, the senior theorists at the university would go out to his office and have lunch. He would have sandwiches sent in. The physics faculty at the Institute is very small, they would join us and we would just sit around in his office and talk about physics. It was an effort on my part to try to make him feel a little bit more a part of the scene. Sherwin: Who was at the Institute? There was [Freeman] Dyson. Goldberger: There was Dyson. I guess [Abraham] Pais was still there at the time when we started that. Tullio Regge, I believe, was there. And in the beginning, they were the people. Goldberger: And our group was Arthur Wightman, Sam Treiman, both of whom are still there. Very frequently, [John] Wheeler and [Eugene] Wigner would come with us. [Valentine] Bargmann. I guess that was about it. As I say, I always felt a little funny about that. But he seemed to enjoy it and it gave him a feeling of at least hearing what it was that was going on. Sherwin: Now in terms of his keeping up with the field, I suppose one of the things that I have gotten a very strong sense of from the very beginning was that there seems to be, in a sense, two Oppenheimers. One—this is even before '42—who was bringing the new quantum mechanics to America. An article that [Robert] Bacher wrote argues that he was one of the most important physicists of this period. Nevertheless, in the way that these things are measured by science and Nobel Prizes, etc., there is no major contribution. But there was always a lot of people I have talked to who said he had not only a broad but a deep understanding of what was going on in every field. What happened to this deep understanding after the war? Or are you skeptical about the depth of the understanding, even in this early period? Goldberger: Well, it is hard for me to judge. In the first place, I was not prescient at the time, and it is always hard to evaluate those things through other people's eyes. I will tell you one fact. When I was just trying to decide what I was going to do after I got my degree, I went to [Enrico] Fermi and said, “I am reasonably certain I could go to the Institute, or I have an assistant professorship offer from the University of Illinois and from the University of Wisconsin.” And someone suggested maybe I ought to go to Berkeley and work with Bob Serber. He was the head of the theoretical physics group at the Radiation Lab. Fermi was very negative about Oppenheimer. He thought that his comprehension of physics was superficial. And that, of course, surprised me, but I followed his advice and decided against going there. Now whether that was the right thing or the wrong thing for me to do is another story, because the Institute was a place where you learned much more from your peers than you did from the great superstars who were around there. And it may or may not have been a good place. I want to emphasize that the atmosphere that he created at the Institute, the fact that he was at seminars, that he interacted strongly with seminar speakers, and, being so quick, he would ask questions before other people had them formulated, all made a very positive contribution to the atmospherics. But nobody ever went to Oppenheimer at the Institute when they were having trouble with a problem, to go for advice, because he was just not in a position to do that. It is hard for me to judge how he operated as a young man. He had a great propensity for making errors in his calculations. There are major blunders, arithmetic errors, and all kinds of errors that are shot full of things that he published. But he was always working on things that were quite fashionable. He was always playing a lead role in recognizing things that were important. He did early work in quantum electrodynamics where he was concerned about the divergence problems in quantum electrodynamics. He worked on cosmic rays and the whole evolution of cosmic ray showers. But behind that work was Bob Serber, a greatly underrated person, being very mild-mannered. Not the least bit flamboyant or charismatic. He was the real force there. Serber, I think, has always been a bit resentful about the fact that people in the first place thought of him as Oppenheimer's student, which he was not. He had his PhD under [John] Van Vleck when he went to work with Oppenheimer, and was very much the solid, strong underpinnings in a lot of that work in the early and middle '30s. Probably the most significant scientific contribution that Oppenheimer made was in the theory of gravitational collapse, and what ultimately has turned out to be the theory of black holes. That was way ahead of its time, and nobody paid very much attention to it, until about—I don't know—1965 or so. It had somehow come to my attention, a friend of mine reminded me—this was a man who was either a graduate student or a young post-doc at Princeton—that I had directed them to this paper of Oppenheimer and [Hartland] Snyder, or Oppenheimer and [George] Volcoff, I have forgotten. Maybe there were a couple of them. I had never worked in the field myself. But he was sniffing around the fundamental problems in quantum electrodynamics, and he had students working on those problems. So he was very close to cracking the whole problem associated with what has come to be called renormalization theory in quantum field theory. Sherwin: But he never pushed it far enough? Goldberger: Oh, it is a very complicated story of literally computational errors made by one student and so on, or he might have gotten it. Sherwin: Would that be Melba Phillips? Goldberger: No, it really is probably more complicated. I can tell you the story, Marty. Goldberger: Well, there was a problem of trying to calculate what were called the radiative corrections to the scattering of an electron in an external field, associated with the virtual emission and absorption of photons, to do this calculation as exactly as you could within the framework of quantum electrodynamics. Now, it turns out that this is sort of a kind of controlled infinity. You put a cutoff in the theory, so you know what you are talking about. The point was that the numerical coefficient of what was a logarithmic divergence turned out to be very significant. Because it was later recognized that if in the calculation, you replaced the mass of the electron that appeared formally in the theory by its expression in terms of a radiative correction to the bare mass, and thereby express the answer in terms of the physical or measured mass, that the divergence in that radiative correction was precisely cancelled by this divergent correction to the mass. But it really depended on the coefficient of something being two-thirds instead of a half or something like that. So that when a student of Oppenheimer's tried this, because Dancoff had not calculated the coefficient correctly, he did not pick up this cancellation. This is sort of an interesting quirk in the history of the renormalization program. Sherwin: So did this essentially wait for [Richard] Feynman's work later? Goldberger: It took on renewed importance right after the war when they measured the so-called Lamb shift in the hydrogen levels. It measured the magnetic moment of the electron and found that it was a little bit anomalous. It was the technical advances provided by the work of Feynman and [Julian] Schwinger, Dyson and [Sin’ichiro] Tomonaga that made it possible finally to put this whole renormalization program into the proper perspective. But as I said, Oppenheimer was sniffing around this problem, and had been for many years. Goldberger: Oh, Teller is completely incapable of putting pencil to paper. I do not think I ever saw Teller do a calculation that was even approximately correct. Sherwin: Let me go back to something totally different. You talked about the Princeton power structure, and as I was sitting out there, it occurred to me that this is something that I should know something about, and the social environment in which all of this existed. It surprised me that Oppenheimer, who arrived with such a cloud of glory, as it were, in '47, did not take the town by storm. Or maybe he did, and after '54 all of that was so damaging. What is your sense of it? Goldberger: I somehow think he never made it really, that he was not the lion there that he might have expected to be. But certainly, at least by the time that we got there, there was no evidence that he was spending every other evening on the west side of Princeton on Library Place. Goldberger: I do not know. I think you ought to talk with someone who was there at the time. Sherwin: Who do you suggest that might be good? Goldberger: Perhaps John Wheeler might be someone who knew. He is in Texas. Some of those people at Princeton like Harold Cherniss. Sherwin: Cherniss I’ve spoken to. Goldberger: I mean, Cherniss was very close to Oppenheimer and might have a much better and more accurate picture of the sociology than I. Perhaps Dyson, although Dyson was a little later. Sherwin: Oh no, Dyson was there from the beginning. Golberger: Well, not quite. He went away for a while. Goldberger: He was there and then he went to Cornell, and then he went back to the Institute. But I do not know, I could never understand it. I would have thought that he [Oppenheimer] would have been really the mayor of Princeton. Sherwin: Right. Did you and your wife know the Oppenheimers socially? I mean, did you do much? Goldberger: Yes. We saw a great deal of them socially. I had what was called a “ten-year membership” at the Institute. It was something that was started by Oppenheimer. I had the opportunity, whenever I wanted, to take a year off. I could do it at their expense. The first time I took them up on that was in 1966. I think '66 was the first year, but I was there two additional times, I guess in 1969 and then again in 1976, right after I stopped being chairman of the physics department. Sherwin: Okay. He died in '67. Goldberger: That is correct. We were both close to them. We were included in all major social events at the Oppenheimers'. During the latter part of his life, after he became sick, I think we used to be over there approximately twice a week. I spent an awful lot of time with him, even in addition to the amount of time that [my wife] Mildred and I did together, talking with him. He felt very lost, being out of the national security advisory business. During the period from about 1960 to 1970, I was very heavily involved in that. I used to talk with him about what I was doing. Not about classified things, obviously, but to try to give him sort of the flavor of the kinds of things that we were worrying about, because he was very eager for that kind of feeling of involvement. But he was a difficult person to be with under any circumstances. I never had the feeling that he answered a question of the most trivial variety in a non-deliberative way. It was almost as though he were acting continuously. In spite of having been very close to him for ten years, I never felt that I was really close to him, that I really understood him. It was essentially impossible to have a casual conversation with him. He took great pleasure in putting people down. Sherwin: Even people he liked? Goldberger: Yeah. It was sort of an instinctive reaction somehow, to make some rather cutting remark, which he did not take very seriously and I never took very seriously. Goldberger: Oh, I remember one occasion we were lined up for some sort of a buffet in his house. Mildred and I were in part of the line and we had gotten involved in conversation with someone, and the line had gone ahead of us and there was a gap. He came over and he said, “If you two can stop being the king and queen of Princeton for a few minutes, maybe we can get this line moving,” or words to that effect. It is not quite the correct quotation. But I did not pay any attention to it. But he and Mildred never got along very well. He did not like women, and he did not like smart women. Mildred is very erudite, and she was not so convinced of his erudition on many occasions. They used to have terrible arguments of an intellectual variety. But they never got along very well. Sherwin: Did she have trouble with Kitty? Goldberger: Everyone had trouble with Kitty. There was a very brief period of time when there was some kind of diplomatic relations. After Robert died, we used to try to help Kitty. Finally, she became so difficult and so abusive in a generalized way that Mildred refused to go there. There were a series of conferences that were held rather sort of bizarrely on the anniversary of Oppenheimer's death, rather than on the anniversary of his birth. Physics conferences. She always gave a reception at her house afterwards. Mildred refused to go. She just had had it with Kitty. There were too many episodes of broken engagements and sort of generalized hostility that she just would not put up with it. Sherwin: Did you find her that way in '57? You must have seen the Oppenheimer seven-part thing [a dramatic miniseries produced by the BBC and WGBH]. Sherwin: I do not know what you thought about it, but I thought that it was shallow in many respects. A lot of the characters were one-dimensional, or if they had two dimensions, it was like two snapshots. That was particularly true of Kitty, who I have talked to lots and lots of people about who have known her from the '30s. It is quite clear to me that she could be nasty back then, but she was not just that. It got worse and worse as time went on and her alcoholism became more oppressive, and Princeton itself. Goldberger: I think it must have become worse. I know there are people who commented on the Oppenheimer series. There were those who thought that Kitty was much maligned. I thought she was treated much too kindly. Goldberger: She never made it at all in Princeton. She never made any effort. I do not know whether that was any component of their lack of social acceptability. It may be that Kitty was just too impossible and the high society just would not take it. I don’t know, I really do not know. Sherwin: Return to Princeton high society. What are you pointing towards? What part of the Princeton community that Oppenheimer was not involved with, would he have been interested in being involved with? Goldberger: There were an awful lot of very wealthy people in Princeton, very influential. People who were influential in New York in the business community, finance. People who were associated with the Council on Foreign Relations. People who were movers and shakers in the outer world. Now you may say he might not have been interested in those people, but he should have been interested in someone. As far as I know, he was not friends with anyone in the physics department. Sherwin: That I find very strange. Sherwin: It sounds like he was not even involved in any way or connected to, intellectually, the physics department. Goldberger: For example, I cannot remember his ever coming to a physics colloquium. He gave one once that was a disaster. Sherwin: Could you tell me about that? Goldberger: He tried to talk about general relativity, and it was just a shambles. It was an absolute shambles. Sherwin: From the point of view of the theoretician. He did not know what he was talking about. Goldberger: That is right. It was just a collection of disparate statements and no coherence and it did not add anything at all to anybody's knowledge. It was embarrassing. I have forgotten now what year that was. But he was a very funny guy. I could never see in him what it was that provoked this adulation among a group of people whom I know who worshipped him, who imitated him. Sherwin: I think it was the earlier days. That is one of the things that I really have to sort of deal with. Now this is, in a sense, sort of the bleakest view of Oppenheimer in the post-[war] period that I have gotten. It also fits in with a lot of my sense of what was not being said. Goldberger: I thought about him, of course, a great deal, as a result of a continuing Oppenheimer series or books or what-have-you. I have never come, in my own mind, to any kind of a rational or coherent judgement about the man. He was a very difficult guy. He was not likeable. I never saw him express any human warmth towards anyone, whether it is family or friend or what-have-you. Sherwin: The whole family situation, of course, was—. Goldberger: The family situation was tragic, just from beginning to end. The one person that I thought there was some hope for was Toni [Oppenheimer]. Sherwin: That story I have tracked down very tenaciously. I was out at St. John's last year or the year before, and interviewed all sorts of people, all over the place. That is one of the saddest stories. Goldberger: It is. It is just fantastic. Goldberger: She was a lovely girl. I knew her off and on during the period while he was sick, and for a period after his death. She did her very best to sort of hold Kitty together for about a year. Goldberger: Under the most difficult circumstances, just incredibly difficult. You have probably talked with Bob Serber? Sherwin: Yes. Before the next phone call comes in, I have one more thing. Sherwin: You used to discuss arms control issues with him. How would you describe his essential philosophy or view or main thrust of his ideas? Goldberger: I do not think I can really respond to that. I think he was very concerned about the evolution of the arms race. Goldberger: I do not think I can enunciate any overarching philosophy. Sherwin: Let me then be specific. This is the period, you say between let's say '60 and his deat,h when you were involved. Sherwin: Okay, so this is the period when if we are talking about '57, there is certainly the Democratic push to get away from massive retaliation during the Kennedy years. There is that jump from the 300 missiles to the 1,000 missiles, the Cuban Missile Crisis. Did you talk to him during the Cuban Missile Crisis? Goldberger: I have no recollection of it. I must have, but I do not have any serious recollection of it. Goldberger: No, I was always a little leery about going too far into those things, because I was so deeply involved myself with the classified programs. I wanted to be especially careful in his case that there be no hint of my fussing around. Goldberger: But I cannot think of anything. Now, when you talk with Mildred, you will find that she is going to be very critical about the role that Oppenheimer played at the end of the war—well, during the war and at the end of the war. One having to do with the Szilard petition, the possible suppression at Los Alamos, and the other having to do with his great fascination and enthusiasm for the May-Johnson Bill [proposed in 1945] about the control of atomic energy. She wrote an article in the Los Angeles Times. She was writing a column for a while, and she was sort of contrasting [Leo] Szilard with Oppenheimer, and Szilard has always been one of her great heroes.